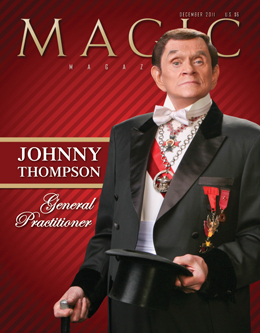 The biggest challenge when doing a story on Johnny Thompson is narrowing it down to which Johnny Thompson you're going to cover. Do you concentrate on the stage magician, the close-up magician, the trade-show magician, the lecturer, the illusion designer, the historian or, more and more in recent years, the consultant? Johnny does seem to defy the old clich&eactue;, "jack of all trades, master of none." In fact, he might just be the closest "master of all" I know, certainly in the magic business. Rory Johnston's story, while filling in all the fascinating background, focuses mainly on Johnny's consulting work, taking us behind the scenes on what he does, and how he does it, when working with Penn & Teller, Lance Burton, David Blaine, and others. Just read the opening story (below), and I think you'll be hooked. 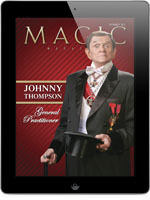 The December issue of MAGIC Magazine is now out, available both in print and on the iPad. Here's an advanced look at what's "between the covers." If you're not a subscriber, please give us a try. Check out our risk-free, one-month-at-a-time subscription plan at the bottom of this email. Of course, we still offer our annual subscriptions as well. MAGIC is also available for your iPad in the App Store. The cost is only $3.99 and it arrives within a few minutes. Best of all, you only buy it once, then you own it forever and can enjoy it wherever you want. In 1965, there was a guy in Minneapolis/St. Paul making silks jump out of a hat. This was Johnny Thompson's invention, which he used in his own act, so when Johnny heard about it he was so incensed that he took a plane to Minnesota, went to the club, and watched the show. The moment the magician did the jumping silks, John stormed up onto the stage, grabbed the prop, broke it, snatched up the mic and announced, "This is my trick and this guy stole it! I'm sorry to upset you during the show, but if he does it again, I'll be back, and it'll be more than this prop that I'll break!" The story of that incident went viral, so to speak — this was long before the Internet — and, for a while, people stopped "borrowing" material from Johnny Thompson. Today, he smiles wryly at the memory and he shakes his head. Those days are gone. Like a fine wine, he has mellowed with age. These days, we have a kinder, gentler Johnny. But, make no mistake, he is no less formidable. Over 250 historians, collectors, and lovers of magic's past descended on Los Angeles November 10-12 to attend the Twelfth Los Angeles Conference on Magic History, organized by Mike Caveney, John Gaughan, Frankie Glass, and Jim Steinmeyer. The three-day celebration of conjuring from times gone by followed a format that may seem staid on paper — a combination of lectures, performances, exhibitions, and wheeling and dealing — but in the event's 22-year history, it has remained one of the hardest tickets to get. If there is such a thing as a perpetual magic machine, Michael Grandinetti is it. He dedicates every waking hour to magic, whether performing, creating, planning, rehearsing, promoting shows, or preparing music, to the exclusion of all else. 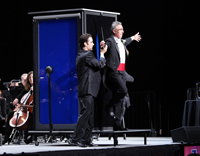 Take, for example, Michael's recent appearance with the Grand Rapids Symphony Orchestra in October of this year. Michael typically threw himself into the details, spending nine months working closely with the Grand Rapids Symphony personnel, meticulously planning first the magic and then the musical portions of the program. 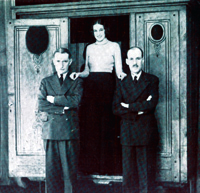 Will Goldston was an intriguing character, touched with genius, and although he was full of contradictions, he possessed a genuine love for magicians and a burning desire to contribute to the progress of the art of magic. Well over a year ago, I finished what I was going to call "The Goldston Story." But I couldn't shake off the feeling that I had missed something. 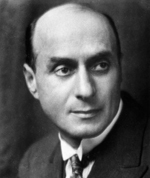 I was convinced that Goldston, whilst arguably the most influential magical author and publisher of the 20th century, was surprisingly a dismal failure as a businessman. The search led through some thirty birth, marriage, and death certificates. Nevertheless, I was eventually able to find answers that allowed a clear understanding of the great man's quite extraordinary private life and clarified the anomalies in his business life. The theme for Halloween Week at the Magic Castle was "Inferno!" Members were advised through posters, flyers, and emails: "For the last week of October, the Magic Castle will be on fire with the spirit of Halloween!" 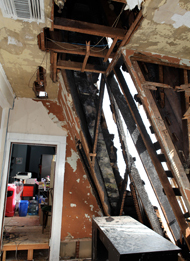 The question of whether the tag line was truly a promotion or a prediction remains open, because at 12:35 p.m. on October 31, a fire ripped through the attic walls of the 102-year-old Rollin B. Lane Mansion that serves as the clubhouse for the Academy of Magical Arts. On the afternoon of Halloween, the unthinkable happened: the Magic Castle caught on fire. Erika Larsen, vice president of the Academy of Magical Arts, and the daughter and niece, respectively, of founders Bill and Milt Larsen, was on the scene moments after the fire had been put out, and began an exhaustive multi-hour vigil while overseeing the restoration efforts. Sitting at the Castle's Owl Bar four days later, at the club's "soft opening" for members only — with the sound of industrial drying units surrounding us — she talked about the experience. The 7th Shanghai International Magic Festival & Competition was held in Shanghai, China, November 2-8. The gathering, sponsored by the government, was themed around the development of the magical arts in China and around the world. About 300 young magicians gathered to hear lectures, see international stars of magic in the gala show, and compete in the stage contest. Magicians might not believe in Santa Claus, but we can still dream, can't we? These pages showcase brief holiday wish lists from the MAGIC Magazine "Marketplace" staff — Will Houstoun, Jason England, Farrell Dillon, Michael Claxton, Brad Henderson, Peter Duffie, Gabe Fajuri, and Francis Menotti. Each writer was given a simple assignment: compile a list of three products you'd be thrilled to receive as a gift this year, then tell us why. The results will, with any luck, give you a jumping-off point for your own list of desirable doodads this holiday season, be they tricks, books, DVDs, or something else entirely. Happy reading and happy holidays! With a cast of characters reminiscent of The League of Extraordinary Gentlemen, The Illusionists brings to the stage a collection of conjurors, each displaying unique presentations and abilities, premiering a new collaborative production in the Concert Hall at the Sydney Opera House in Sydney, Australia, January 12-18, 2012. 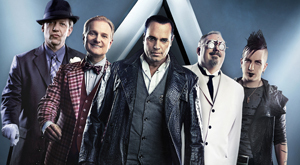 Characters featured in the show include The Grand Illusionist (Brett Daniels), The Gentleman, (James Dimmare), The Trickster (Jeff Hobson) The Inventor (Kevin James), and The Anti-Conjuror (Dan Sperry). Two others, The Escape Artist and the Mentalist, will also be included in the cast. After Harry Houdini died in 1926, his final resting place became the Machpelah Cemetery in Queens, New York, where the centerpiece of the family burial plot was crowned with a bust of the famed magician. The gravesite has withstood the decades, with one exception: the three-dimensional visage of Harry overseeing the Weiss family. The famous bust was destroyed by vandals in 1975. Aside from some temporary replacements used on special occasions, the bust has remained missing for the past 36 years — until now. The Museum of the Moving Image in New York City will host a special Magicians on Screenretrospective, taking place from December 10 through January 1. Guest curator JoAnn Hanley has selected a wide range of magic performances from film, kinescope, television, video, and computer animation, along with guest lectures and live performances, including Ben Robinson. A sad farewell to John Daniel. We round out the tenth year of Joshua Jay's "Talk About Tricks" with an issue brimming with non-card miracles and people named Josh. We begin with Jeff Prace's version of Ring Flight using an iPhone. Josh Janousky shares an alchemy-themed routine in which you change the metal on your ring, and Josh Weinstein shows you a humorous interlude with an unlit cigarette. 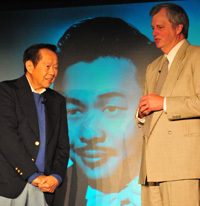 David Solomon and Ken Niinuma provide excellent card routines, capping off a decade of trick talk. 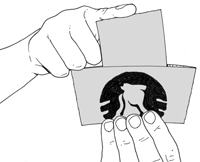 Two flat Starbucks coffee sleeves are introduced. The magician inserts one of them inside the other in a perpendicular position. When the upright sleeve is pushed and pulled back and forth through the horizontally held sleeve, it turns repeatedly inside out and outside in. Your stunned coffee mate then removes the sleeve to find it permanently inside out, just like their sense of reality. 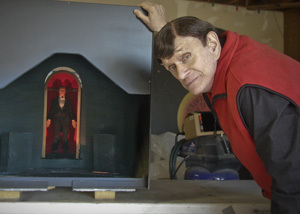 Charles Carter was well aware of Cyril Yettmah's creative abilities, as well as the tragic fire that destroyed his warehouse full of original illusions. Seeing no reason why these ideas should go to waste, Carter offered to bring Yettmah back to America to work as a consultant. Early in their negotiations, and shortly after the fair opened, Carter faced his own catastrophe. His magnificent Temple of Mystery, the enterprise from which he hoped to "clean up a quarter of a million simoleons" was proving to be a commercial and financial disaster. He immediately shifted his efforts toward another world tour, and thus still pursued Yettmah's ideas and illusions. Successfully mixing magic with singing is a true challenge. The danger lies in the magic being lost in the song and lyrics. Lance Rich has taken on the process of how to balance the two elements in an entertaining fashion that is not at any cost to the magic. He loves to sing, he loves to do magic, so why not do both? In the spirit of New Year's Eve predictions, I have carelessly synthesized macroeconomic forecasts, technological vulnerability factors, and an opinionated assessment of the state of the art. I offer "New Year's Predictions for the Coming Decade: Who Will Live and Who Will Die" — by category.